No matter the type of food service establishment, proper cooking equipment is key. While some tools/smallwares have a very specific use, many have a variety of broad uses in a busy kitchen. Browse through our selection to find just the right combination of utensils, post, pans and more to make your kitchen operate a maximum efficiency. Braziers are ideal for slow cooking and browning meats. Choose from a standard or induction capable brazier in a variety of sizes and depths to easily slow cook your favorite meat and veggies together, allowing the flavors blend magnificently. Whether you are baking cookies or rolls, or broiling vegetables or appetizers, a sheet pan is the tool of choice. Perforated pans allow for greater air flow, perfect for a crispier crust. While non-perforated pans are ideal for cookies and biscuits. Available in quarter, half, and full sheet sizes, these versatile pans come with a variety of edge and finish options. Use with a bun pan rack to maximize space in your kitchen. Canned foods are used in every kitchen, be sure you have the right can opener on hand to get the job done. A hand held can opener is perfect to lower-volume kitchens. For high-volume use, select a #1 can opener to quickly and easily open large and tall cans on a daily basis. When what you want is inside a large bucket, use a convenient pail opener to avoid broken lids, spilled contents, or injured hands. In order to adhere to HACCP regulations, hot foods must be cooled down before being placed in the refrigerator. Cooling paddles go directly into cooking pots and other food storage containers and quickly cool down foods, minimizing the time spent in the danger zone temperature when bacteria can grow. Simply fill with water, freeze, and stir hot foods. A chef's knife is his most versatile tool, and every chef has his favorite. So we offer a variety of sizes and styles to suite any kitchen, and chef. From carving and boning, to paring and cleavers, there is a right knife for every job in the kitchen. Select the proper blade shape, then choose the blade size and handle you prefer. Behind the bar or in the kitchen, cutting boards protect work surfaces and create a safe, sanitary food prep surface. Color-coded cutting boards help reduce the risk of foodborne illness due to cross-contamination. Created in a multitude of sizes, these non-porous cutting boards have a variety of features like hanging hooks, and non-slip grip. Food dishers and ice cream scoops come in a variety of sizes for use in a multitude of food service applications. Ice cream scoopers are sturdy enough to scoop frozen ice cream from the bottom of a 5 gallon container. Food dishers feature a squeeze handle that ensure that no food is left in the scoop, making them ideal for portioning rice, mashed potatoes, pudding, or gelato. When serving sauces, soups and dressings the best choice is a ladle. Made of plastic or metal, for use in the kitchen or on the buffet, ladles are available in a variety of sizes to suit any need. A double boiler allows you to cook temperature sensitive foods like caramel and custard, without burning them. Steamer baskets make it easy to boil lobster, cook fresh pasta, or steam vegetables. 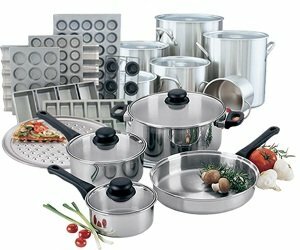 Available in sizes 8 qt to 80 qt, these versatile cookers will get plenty of use. Plastic food pans, lids, and drain trays are perfect for buffet tables, salad bars, and kitchens. Available in a variety of colors, including clear, amber, black, and white, food pans come in sizes ranging from 1/6 size to full size pans to fit most cold or hot food wells. Prep, store, and serve foods all in the same versatile container. Prep foods ahead of time, transport ingredients to an off-site event, and store left overs in convenient food storage containers. Great for sauces and dips, as well as a back up supply of lemon and lime garnishes at the bar. Pair them with the matching lids to avoid spills. Fry pans sloped sides so food slides out easily, making them ideal for cooking scrambled eggs and fried fish. Sauté pans have a wider base and straight sides for maximum heat conduction, which is perfect for searing and braising meat, as well as poaching and stir fry. Choose aluminum for excellent heat conductivity or stainless steel for durable, heavy duty use. Shred cheese, grate orange rind, slice mushrooms, press garlic, or scoop melon when you use one of the many garnishing tools available. Make sure you have the right tool for every job in the kitchen, including: lemon/lime squeezer, olive spoon, kitchen scissors, wooden spoons, bagel slicer, and more. If you're going to serve pizza, you've got to get the dough right. From pizza screens and trays, to pizza pans and cutters, our supply of pizza prep items will help you create a delicious pizza pie every time. Keep your customers coming back for more. Whether aluminum or stainless steel, sauce pans are ideal for cooking and reducing sauces, as well as simmering and boiling foods in liquids. Portion control scales create consistent output from the kitchen, and mean less loss from over-portioning. Mechanical scales have a dial face that is easy to read, and a removable platform that is easy to clean. Digital scales provide even greater accuracy and can run on AC or batter power. Scrapers and spatulas are helpful with batter and dough, as well as sauces. Be sure to get every last drop when you scrape the edges with these efficient tools. Stir batter, spread frosting, add condiments to burgers, and much more with quality commercial spreaders and spatulas. You'll be able to get every last drop out of the sauce pan, and expertly apply a schmear of cream cheese to toasted bagels. Available in standard weight or heavy weight stainless steel, there is a pan to fit your needs as well as your budget. The wide variety of steam table pans allow you to customize your buffet or steam table. Choose from shallow or deep pans in full or half size to accommodate the selection of foods on your display. Stock pots and sauce pots are ideal for cooking soups, stews, vegetables and more. Available in standard or heavy duty style in stainless steel and aluminum models. Matching lids help retain heat and moisture. For the freezer, the oven, or the sauce pot, an accurate temperature reading is essential to maintaining safe food temperatures. To easily check the internal temperature of meats, a probe thermometer is inserted and quickly gives a digital or analog reading. Pocket thermometers come with a protective sleeve, allowing chef's to safely carry them in their pocket. Set it and forget it. Being able to set a digital timer, allows a chef to start the food cooking, set the timer for when to attend to the dish, and then go on to prepare something else until the timer rings. Safely work with hot foods, especially those in boiling water, with a pair of long-handle stainless steel kitchen tongs. They also work great on the grill or with any hot food that needs handling. Flip burgers on the grill, turn french toast, and remove poached eggs with a durable commercial grill turner. Available in a range of sizes and with a variety of features like a perforated or slotted blade, and wooden handles. Or choose a pie server for desserts or pizza. Whip egg whites into stiff peaks for meringue with a versatile French whip, or gently aerate sauces with a piano whip. Whether your whipping up liquids, dry ingredients, or both, a quality whip can get the job done. Available in a variety of styles, lengths, and handles to suit your needs.